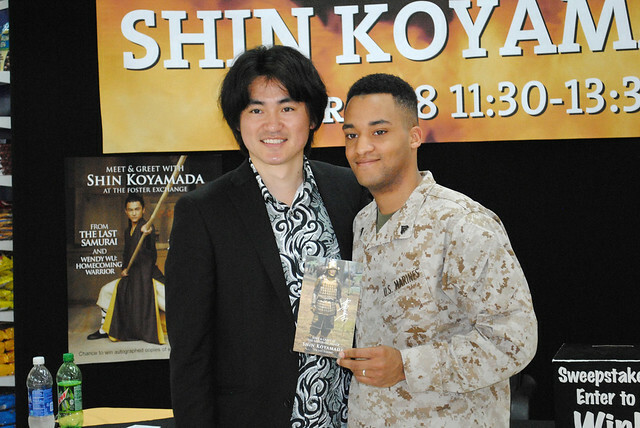 The United States Marine Corps' Camp Foster and KIF Okinawa organized a special 2-hour event “A Meet & Greet with Shin Koyamada" at the on-base shopping center for all the good folks stationed and living in Camp Foster, which is located in Ginowan and Okinawa City. Behind the table set up for Koyamada to sign autographs, the Camp Foster staff prepared a professionally designed background wall plastered with Koyamada's name and all the titles of his films. The event was repeatedly announced throughout the Camp's media outlets, even during the event, to encourage people on Base to come out. A lot of American troops and their families showed up and waited in the long line to meet Koyamada to get his autograph and take personal photos with him. The Camp also in advance had prepared photos for Koyamada to sign. After an hour of nonstop meet and greets, Koyamada and his team took a quick break at the Base's Subway sandwich shop then continued for another hour of autographs and photo ops. The troops, their families and the Camp workers were all ecstatic to meet Koyamada. The Camp Foster reps expressed their interest in doing something similar in the near future.